The golden trout is a highly prized catch that is native to a very small section of the Kern river system in California. It is widely considered to be a subspecies of rainbow trout. Golden trout are easily distinguishable by the red lateral line and the parr marks down both sides, which they keep throughout their lifetime. It is the state fish of California. A native golden trout can only be found in cold and swift streams high up in the Sierra Nevada mountains. Most golden trout live from 7,000 to 10,000 feet above sea level, but it is not uncommon to find populations above 10,000 feet. 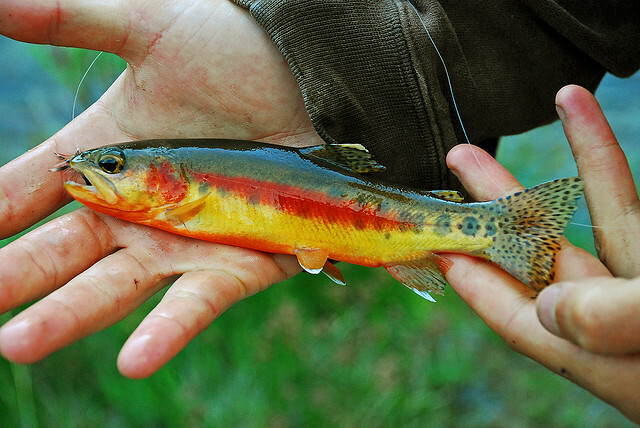 Golden trout have been widely introduced in multiple places. Generally, they do not fare well as an independent population and tend to either hybridize with indigenous rainbow or cutthroat trout. However, you can still encounter a few in certain places around the American west. Golden trout are mainly caught by fly fishermen, and they are known to be particularly aggressive on surface takes to dry flies or terrestrials. A native golden trout usually remains very small, about 6 to 8 inches on average with anything over 10 considered a trophy. Populations that have been introduced to lakes have been known to reach 20 inches, and the largest golden trout ever caught came out of a lake in Wyoming and weighed in at over 10 pounds. The golden trout faces similar problems as most threatened species, namely habitat loss and competition/interbreeding from non-indigenous fish. We at the Amberjack Journal think they’re some of the coolest looking trout that you can catch. Check it out. **The California golden trout should not be mistaken for the Palomino trout, which is often called a golden trout due to it’s unique color. The Palomino trout is simply a color variation of the rainbow trout, and is largely created in hatcheries.